You may recall that in May, on the 28th, I posted Did Jesus Survive the Crucifixion? The posting was mostly about an article that appeared in May issue of The Review of Religions by Arif Khan, The Sudarium of Oviedo and the Shroud of Turin. The Review of Religions is a significant international magazine published by the Ahmadiyya Muslim community. 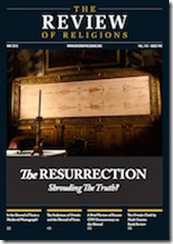 In their May 2015 issue (http://reviewofreligions.org/date/2015/05/), the London based publication, The Review of Religions, reprinted several of my Shroud articles and published a new article about the Sudarium by staff writer Arif Khan. The 113 year old magazine is published by the Ahmadiyya Muslim Community in the U.K. and their May issue also included a large selection of my 1978 photographs. The issue was received very favorably and the publishers have graciously invited me to attend and speak at their 49th annual Jalsa Salana UK Convention in Hampshire, England this August. I immediately contacted Pam Moon in West Midlands, England, who created the beautiful Shroud of Turin Exhibition (http://www.shroudofturinexhibition.com/Shroud_of_…/Home.html) which she tours around the U.K. and she has happily agreed to bring her exhibit to the Hampshire event as well. From the Archives: Is the Shroud of Turin a Medieval Photograph? The official photographer of the 1978 Shroud of Turin Research Project explains whether the theory that the Shroud is merely a photograph taken in the 14th century is true or false. Islam has a special eschatological role for Jesus to play at the end of time. Years ago Arnold Toynbee expressed his doubts about the Bible (OT and NT) as revelation and today we have RD, who has posed an even bigger challenge. Trying to post a comment. It is sad to see that there is a lack of general knowledge when it comes to many issues, including religion. Which is what makes one wonder if it is worthwhile going to England. Why not go directly to the source (India, to learn from the Hindus as well as Muslims) and Pakistan (to hear what the Muslims have to say)? They will say that Jesus is not buried in Kashmir, and that is not only because Hindus in general also worship Jesus as “avatar” (incarnation of God with special powers) and there dozens of Hindu temples with sculptures or pictures of both Jesus and the Virgin Mary. Mainstream Islam also has an eschatological role for Jesus to play at the end of time. What proof is there that Jesus is not buried in Kashmir? The Muslim caretakers of the tomb say that Yuz Asaf was a Muslim and that the place just serves as a tourist attraction, but not because Jesus is really buried there. The latest news we have is that the owner does not believe that the ossuary came from the Talpiot tomb. Before concentrating only on scripture, why not read the points RD has raised? Here is material to be tackled. The religious idea of resurrection was already known in ancient Egypt. Osiris was the Resurrected Savior-God of life and of death. >…Osiris was the hope of everyman. His resurrection from the dead proved beyond doubt that there was life after death just as there was a new flood every year, a new heliacal rising of Soped, Sirius (the Greek Sothis), the brightest stationary star of Isis at the heel of the constellation Orion, symbolic of Osiris and bringer of the New Year and the new grain. >…All human or divine miscreants capable of harming the resurrection of Osiris, had to be kept at a distance, and especially the followers of Seth, who never gave up trying to make incursions, or other malevolent intruders were kept at bay. Where are the differences with the Faith of Christianity? The idea of the annual resurrection of the god is very ancient, is pervasive throughout very many cultures, is tied in with the several fertility cults, was seen as essential for the crops and the sustenance of the peoples, their flocks and herds. It tended to develop with the rise of the individual agricultural revolutions following the hunting and foraging periods of the several civilisations. Probably one of the earliest alphabetic script of about 1400 BCE concerns an epic of the Phoenician god Baal-Hadad, a young virile god who dies in the autumn but is resurrected in the spring. The cult had an attraction for the early agricultural Israelites, and was often condemned by the prophets, notably Ezekiel. A feature of such fertility cults sometimes involved human sacrifice in order to fertilise the soil. Following the return of the exiles, many of those who had married non-Jewish spouses were forbidden to return to Jerusalem and there was a strong Jewish settlement in Alexandria, eventually giving rise to the Greek Septuagint. I have sometimes wondered whether their exposure to Egyptian funerary practices, together with the philosophy of Alexandrian Greek Platonism may have influenced the maturing development of resurrection theology from about 200 BCE. This developing pattern seems evident in some of the later deutero-canonical works of the Septuagint. It is not difficult to detect the nonsense one sees in the realm of Shroud studies. This generation of “Shroudies” is largely responsible for no new hands on examination of the Shroud. No one expected Pope Francis to swing a thurible at the exposition, but he did not even kneel in front of it. We will all be dead and gone by the time something gets done and since some people, including scientists, speak about survival after death in the context of the relic what they are left to think about is whether they will be resurrected, reincarnated or just turned to dust. I think one of the reasons for the nonsense is that the relic remains off-limits for further investigation. Many are genuinely interested in the enigma of the image, but in the continuing absence of availability, speculation needs thrive. It must be this, or it must be that. What I wrote above, I suspect is all part of the deity’s plan in revealing himself by eventually taking on our humanity, and revealing himself through the person, crucifixion and resurrection of his Son. Correct to an extent because the nonsense had begun before the relic became off limits, with the result that serious scholars and scientists also paid the price for the rubbish that others had published and the clashes occurred in newsletters and websites. The Son had his own views about God, Moses and Scripture. Biblical scholars and theologians are slowly beginning to chance their approach because they have to. That way they can also grasp what Jesus really meant and contribute to a more convincing systematic theology.